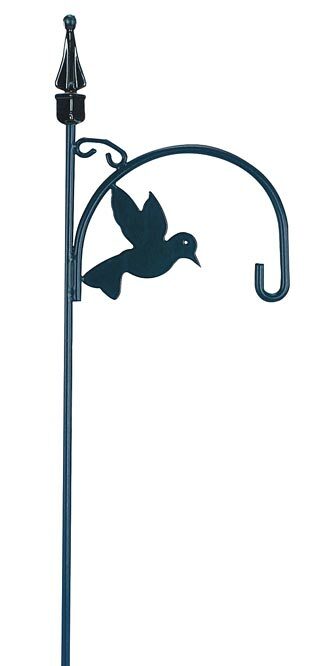 Keep birds in your garden all year with the Gardman Bird Shepherd Hook. A metal bird shape in the hook adds a decorative element to this unit. The small scroll between the hook and the shaft, combined with the angular finial, add more detailing to the hanger. The 10" hook can hold any lantern, bird feeder, or ornament up to 19" in diameter. The sturdy steel construction and black color will withstand several years of use. The included 10.75" "step-in" base creates a strong anchor for the hook. Display your love of birds using the Bird Shepherd Hook.